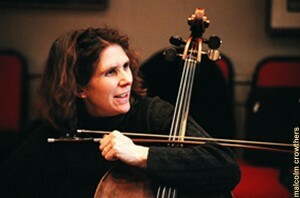 Jane Salmon has established a reputation as one of the busiest and most successful cellists of her generation. Her work as a chamber musician and as a recital soloist has taken her to more than 40 countries across the world and has involved her in recordings, broadcasts for radio and television, festivals and performances in many leading venues. Apart from major venues in North America and Europe, her travels have taken her as far afield as Nicaragua, Peru, Kathmandu and Borneo. She is a founder member of Endymion having met many of the players in the National Youth Orchestra. Jane’s work with Endymion, the Schubert Ensemble of London and other leading London ensembles has covered major chamber repertoire but also new work and especially premieres of works by leading contemporary composers and has recorded more than 30 CDs. As a recitalist she has premiered solo works on BBC Radio 3 and in concerts on London’s South Bank and Wigmore Hall. Jane has broadcast UK premieres of solo works by Peter Sculthorpe, Anthony Payne, John Buller, Anthony Gilbert and Paul Patterson all for Radio 3. Recital tours have included two visits to India where solo performances to large audiences were juxtaposed with educational work in Madras, Bangalore and Calcutta. More unusually, Jane was the on-stage cellist in the Royal National Theatre’s award-winning production of the Arthur Miller play ‘Broken Glass’. A graduate of Cambridge University, Jane studied the cello with Amaryllis Fleming, Pierre Fournier and Johannes Goritzki. She won numerous prizes and awards and was selected for promotion by Young Concert Artists Trust which launched her solo career.